Home » Belief systems » Positivity and Health | Do Your Thoughts Affect Your Health? Positivity and Health | Do Your Thoughts Affect Your Health? Is it possible that a positive attitude has a direct (positive) impact on your health? Most of us have heard about the power of positive thinking from a young age. Our parents would tell us “you can be anything that you want to be”, “don’t let anything stand in the way of your dreams”. Even our coaches and teachers joined in. And I would hazard a guess that most of us have experienced it in one way or another during our lifetimes. Maybe you wanted to get backstage with your favorite band, or you wanted the opportunity to work in a foreign country, or you were looking for a promotion. If you really wanted something bad enough, you kept thinking about it and imagining it happening. Doubts might have crept in along the way, but overall you kept yourself in a positive frame of mind and maybe even “just knew” it was going to happen. And many times it did. What is it for you? There’s something. Something you just kept dreaming and thinking of a way to have it happen. And eventually it did. For me, I always had a dream that I would meet my favorite band (Great Big Sea, from Newfoundland) and share a beverage with them, and on the night before my 50th birthday, it happened. I actually also “sang with Great Big Sea”, but that’s another story for another day. 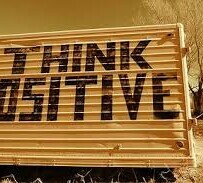 So, back to the question, is it possible that a positive attitude has a direct (positive) impact on your health? Over the past 5 years, I have come up with a new dream for me. In 2008, I was diagnosed with an autoimmune dis-ease (rheumatoid arthritis) and told that I would have it for life and always be on prescription drugs. Ever since, I have had the dream of returning to good health with the condition disappearing. Crazy, right? Autoimmune conditions don’t just go away. There is no known cure for them. They’re like cancer. There’s no known cure for cancer. Cancer doesn’t just go away. How many times have you heard that? It has to be true, right? It has to be true because you’ve heard it said so many times, and the doctors are saying it’s true. So it has to be true. In other cases, a person gets their diagnosis, accepts it as given and it turns out to be true. There are many cases of people who are given a prognosis of 6 months to live and they die right about the 6 month mark. What’s the difference? The very consistent theme in the stories I have been exposed to is that the person has decided that life was very much worth living and they decided to make changes. Virtually by definition they adopt a positive attitude to the possibility that it just might NOT have to be this way after all. They literally do not accept the outcome that has been forecast. Many talk about changing their diet to healthy alternatives, becoming more accepting and loving of themselves, figuring out what they are grateful for and taking the time to acknowledge them, forgiving others, meditating, giving up “worrying”. All of these are steps of removing negative factors from their lives to the best of their ability, and focusing on the positive factors in their lives. While I won’t go into detail here, there is a massive volume of both science-based and mind-body-spirit connection material that is suggesting that we are only beginning to understand the power of our minds. I encourage you to do a bit of research if you’re interested in finding out more (I keep a list of recommended resources on my web site). The findings are quite clear. When we approach life and health from a positive perspective, we “attract” positive things into our life (think of the “placebo effect”). When we slip into the negative perspective, we “attract” negative things into our life (the opposite of the placebo effect is the “nocebo effect”). Our beliefs affect our outcomes. So, back to the question one more time, is it possible that a positive attitude has a direct (positive) impact on your health? My belief after these last 5 years is that a positive attitude not only has a direct positive impact on your health, it is absolutely the biggest contributor to the state of your health. For me personally, I never lose faith in my body’s ability to restore itself to health. I may not know when or how it will happen, but I will never lose hope. I’ll leave it to you to decide if you adopt the same beliefs. If I hear a prognosis along the lines of “this is a terminal condition and 65% of the people die within 1-2 years”, I wonder about what the 35% have done differently, and I search for the examples of any that have lived a long time or spontaneously recovered. When I hear a doctor suggest that “we don’t know what causes this”, I think about what the potential root causes might be (diet, lifestyle, unhealthy job conditions, poor relationships at home, with friends or family, etc.) and encourage people to look at those as I feel they are all contributing causes to many physical health conditions. When I hear about another awareness campaign for a dis-ease, I ask where the associated health campaign is (Mother Teresa was quoted as saying she would never attend an anti-war protest but she would come to every peace rally). I don’t want any more awareness about dis-ease, I want to focus on promotion of health, and awareness that our bodies can return to health. I like to remind people that we don’t have to wait for a health scare to start taking these positive actions now. I wish that all of this was easy for anyone that was diagnosed with any condition. I wish that we could simply flip a switch, become super positive, make a few simple changes, and watch our bodies return to health. And while I believe that we can, the part of the story that is often not shared is that healing is a journey. Most conditions don’t just happen overnight, nor in most cases will they go away overnight. Healing truly is a journey, a test of faith, and there are often obstacles along the way. But I always come back to one simple question that I ask myself “does it really matter if I achieve a perfect return to health?”. The truth is that I know I can’t control the outcome, but if I have done everything possible to switch myself into a positive frame of mind, I will definitely be a lot happier during the journey. Check out “Healthtember” on my web site, where we use the month of September to focus on positivity and emotional, physical and spiritual healing. I truly believe that our thoughts impact our health. Our thoughts are things and carry weight (I.e. they’re significant). They also have a vibrational frequency that resonates from the body and connects with others – attracting other like-minded beings. There is no doubt in my mind that our thoughts impact our health. Great post Ken!